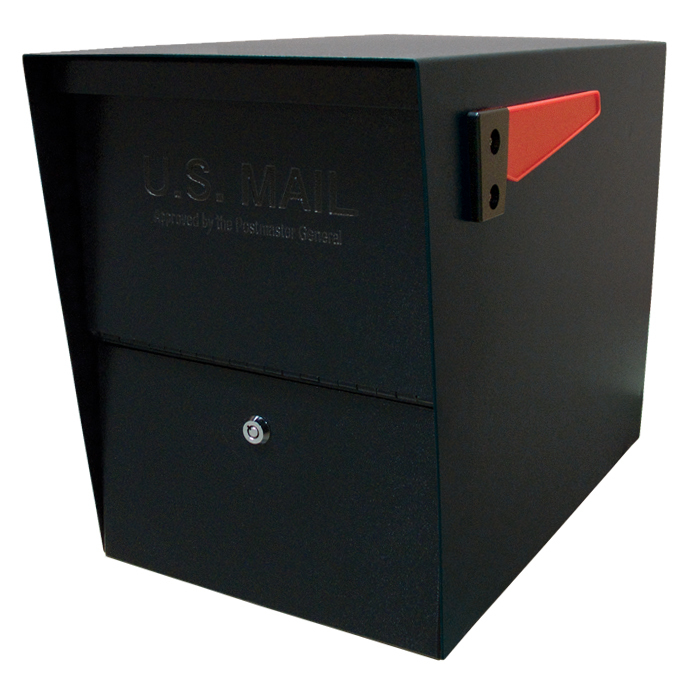 The Mailboss Package Master locking mailbox is larger than most residential mailboxes and can be mounted on an optional metal post or many existing mailbox mounting systems. In some communities there continues to be issues with theft from mailboxes for the purpose of identity theft or the theft of small packages, such as mailed prescriptions. One way to fight back is by using a locking mailbox, but many do not offer the space for those small packages. There is however, an option available that can provide protection from theft while still allowing the postal carrier complete access to your mailbox without the need for a key. Mail boss offers the Package Master locking mailbox that has two separate hinged doors. The postal carrier can place the incoming mail in the top door and when the door is closed the mail drops into a lower level, protected by a lock. Once the mail falls into the lower space, an internal hinged plate rises into place to prevent prying hands from reaching the mail that has dropped to the bottom. The locked lower level allows the owner to retrieve their mail. A small shelf at the top of the upper level allows outgoing mail to be picked up by the postal carrier. Made of 12 and 14 gauge steel, it is secured with a brass core disc lock to prevent prying, even by most tools. Although it is equipped with a “fast track” mounting plate, it too is secured against prying to prevent the theft of the entire mailbox. Stainless steel hinges and hardware provide for long life and as added protection against the weather as well as mail thieves. The incoming mail opening measures about 1.5-inches high by 10.5-inches wide with a retrieval opening measuring five-inches high by 10.8-inches wide to accommodate many small packages, including most prescriptions. It is available in five colors to match the appearance of the home. Fishing through this mailbox for checks or personal information is made that much tougher and once would-be thieves realize the level of difficulty that has been installed, they likely will move on to an easier target. Introducing the Mail Boss Package Master by Epoch Design. Patented baffle door design and security features prevent fishing and leveraged entry. See why the MailBoss Package Master provides ultimately security!